From reading Parts 1 through 3 you accepted the responsibilities of becoming a dog owner, decided upon the age and gender of your pet, narrowed your breed alternatives, and learned how to evaluate breeder, shelter, and rescue facilities. The next step is learning how to examine adult dogs and individual puppies from within a litter to determine their suitability for inclusion into your household. This section will deal exclusively with evaluating an adult dog. Part 4B will address puppy testing. Whereas, in many ways a puppy is a malleable blank slate whose genetics are predetermined, but whose temperament and corresponding behavior is mostly impressionable to the environment, an adult dog possesses a more cemented temperament and more solidified behaviors. Consequently, the evaluation process is imperative when successfully purchasing or adopting the correct dog for your household. Since a firsthand observation at the breeder’s site, animal shelter, or rescue agency only allows you a temporary microscopic observation of the dog’s temperament and behavior, you should also request a more protracted macroscopic overview before formally committing to the animal. 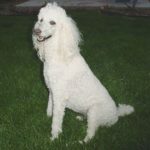 A macroscopic overview includes a thorough chronological history of the dog that includes information regarding the animal’s temperament, socialization experiences, residences, lifestyle, health, training, household manners, and pertinent behaviors. You should obtain the history by interviewing the seller or agency representative. In addition, you will need to personally observe the dog in multiple environments and in multiple situations, including at your home integrating with your family and existing pets. The preceding takes time. Therefore, we strongly recommend demanding a minimum seven-day trial period in the purchase or adoption contract, whereby within the stated amount of time you can return the dog without penalty for any reason you deem appropriate. Why purchase or adopt an anxious or aggressive dog when a friendly, confident dog will more easily and successfully integrate within your household? This dog is blatantly fearful and potentially aggressive. We recommend finding a better tempered dog. When investigating the prospective pet’s history, interview the seller or rescue agent thoroughly regarding the dog’s prior behavior, especially in the areas of household manners, housebreaking, aggression, anxiety, and dominance. History tends to repeat itself unless extensive training intervenes. Why adopt a dog with a history of house soiling, biting, destructive separation anxiety, nuisance barking, excessive stubbornness, or escaping when dogs with fewer or less severe problems are readily available? Obtain a health history of the animal and request a current veterinary examination as a condition of sale or adoption. A dog with heartworm or hip dysplasia, even if available at no charge, immediately becomes an expensive and time-consuming proposition. Observe the dog’s present behavior amidst adults, children, dogs, and even cats. If you see signs of unacceptable aggression, excitability, or anxiety, consider another dog. While at the purchase or adoption location, conduct an amended version of the Puppy Tests detailed in Part 4b. However, be careful when conducting tests 3 through 6, especially 6b, as the evaluation may become dangerous if an adult dog becomes aggressive due to any of the test procedures. In addition, you may need to temper other tests and will need to substitute other adult dogs for littermates when conducting tests 11 and 12. If the dog’s history doesn’t raise red flags and the dog behaves admirably at the breeder’s facility, shelter, or rescue site, ask to take the dog home for a test drive before completing the purchase or adoption. During the trial period, initially do your best to provide a calm and relaxing environment. Introduce the dog to existing pets slowly and on neutral territory (defined as an environment either unfamiliar or vaguely familiar to each dog, where both animals will be comfortable and neither is likely to exhibit territoriality) to reduce the likelihood of conflict. You may wish to ignore minor anxiety, aggression, or household foibles during the first two to three days. 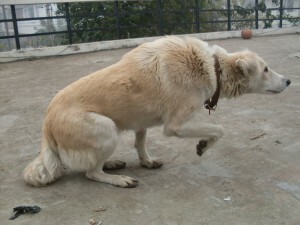 However, if the problems are severe, return the dog and find a more suitable animal. Similarly, if the minor problems persist throughout the trial period, find a more suitable dog. Once the dog has settled in, after three days treat him as you would treat him normally once he becomes a full-fledged member of your household, including leaving him/her alone for short periods to test for signs of separation anxiety and house soiling. Also, expose him to a variety of places that you frequent (different rooms in the house, outdoors, walks in the neighborhood, public parks, pet stores, playgrounds), activities in which you wish to engage (running, retrieve games, hiking, obedience, agility), diverse social situations (meeting individuals, integrating within crowds, at dog parks, proximal to cats), and a variety of people (men, women, young children, teenagers, tall people, heavy people, disabled people, people wearing hats or sunglasses, minorities). If he behaves inappropriately and the situation or environment is one he will encounter frequently while living in your household, return him/her to the breeder, shelter, or rescue agency before you get emotionally attached. Furthermore, if the dog behaves appropriately, but his/her presence causes distress to existing pets, you may also consider returning him/her and finding a more suitable pet. You better serve your family, family pets, and the new dog by purchasing/adopting a dog that readily integrates within your household without undue stress, toil, or risk of aggressive conflict to any involved party. If you feel uncomfortable conducting the initial interview, the preliminary observations, or aspects of the trial period yourself, obtain the services of a CPT trainer who will confidently and competently assist you through the process. Similarly, if you are uncertain or hesitant completing a final determination of the dog’s suitability, please consult the services of a CPT professional. Adding a new long-term canine member to your household is as serious a decision as contemplating engagement or the adoption of a child. Making the wrong choice can bring years of unhappiness and/or a potentially painful divorce. On the other hand, making the right choice can provide years of blissful companionship, plentiful joy, and an enhanced quality of the life for every human and animal within your family. Our intention is that by completing the protocols provided in each part of this article, you will maximize the probability of benefiting from a successful decision. The right dog makes an outstanding companion that enhances the quality of life for everyone within your family. © Copyright Mark Spivak and Comprehensive Pet Therapy, Inc., April 2007, Revised March 2014. All rights reserved.